By Allison Graves, John Kruzel on Monday, January 16th, 2017 at 11:14 a.m.
Donald Trump’s 2018 official card says "Merry Christmas"
By Miriam Valverde on Tuesday, December 4th, 2018 at 10:53 a.m.
For the second year in a row, the official White House greeting card for the end of the year celebrations wishes Americans a "Merry Christmas." "Merry Christmas and a Happy New Year," said the official 2018 White House card, signed by President Donald Trump, first lady Melania Trump, and their son, Barron Trump. The card's message is in line with Trump's campaign promise to depart from the broad "Happy Holidays" wish and focus on the Christian-oriented expression "Merry Christmas." Trump also refrained from using the "Happy Holidays" phrase during the national Christmas tree lighting ceremony on November 28. "On behalf of Melania and myself and the entire Trump family — many of whom are with us tonight — I want to again wish you all a very, very Merry Christmas," Trump said. "May this Christmas season bring peace to your hearts, warmth to your homes, cheer to your spirit, and joy to the world. Merry Christmas, everyone. Merry Christmas and God bless you." We did not find "Happy Holidays" mentions on Trump's Twitter feed since taking office. He only used the term "holidays" in a Dec. 21, 2017 tweet about a potential government shutdown, then claiming: "House Democrats want a SHUTDOWN for the holidays in order to distract from the very popular, just passed, Tax Cuts." PolitiFact also did not find a reference to the phrase on the White House website. First lady Melania Trump came close in a Nov. 26, 2018, tweet with a video of White House Christmas decorations and the text, "The People's House @WhiteHouse is ready to celebrate Christmas and the holiday season!" Trump as a candidate said, "We're going to be saying Merry Christmas at every store. You can leave (happy holidays) at the corner." Retailers continue to use the phrase "Happy Holidays," but so far, Trump as president has stayed away from using the term. We will continue to monitor this promise over the coming years. For now, we rate this Promise Kept. By John Kruzel on Wednesday, November 29th, 2017 at 1:14 p.m.
President Donald Trump's annual White House greeting card features the phrase "Merry Christmas," a departure from the broad-based, less explicitly Christian holiday message from his predecessor. 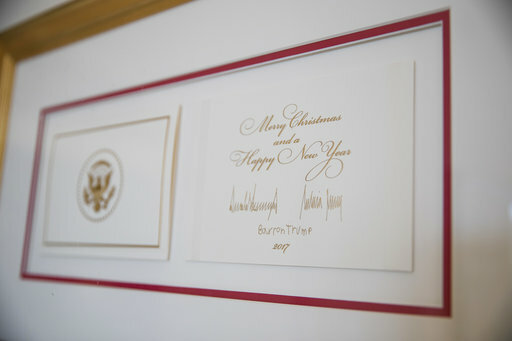 The Trump family card, signed by the president, first lady Melania Trump and the couple's 11-year-old son, Barron, is emblazoned with the presidential seal opposite the words "Merry Christmas and a Happy New Year." During the 2016 campaign, Trump vowed to purge the phrase "Happy Holidays" in favor of "Merry Christmas," in part to take on the culture of "political correctness." Trump's promise also buoyed his Christian backers, particularly evangelicals, many of whom feel their faith is under attack in an increasingly secularized country. Eighty percent of white born-again and evangelical Christians voted for Trump, according to exit polls by a consortium of media outlets. Since taking office, Trump has not tweeted the phrase "Happy Holidays" and the term has not appeared on the White House's official website, whitehouse.gov. Invoking "Merry Christmas" on the White House greeting card earned Trump plaudits from conservative commentators. The tradition of presidential holiday cards dates back to President Calvin Coolidge, who in 1927 issued a handwritten Christmas message to the American people, which was republished in newspapers across the country. The Obama family continued this custom while in the White House, but opted to send a broader holiday greeting rather than using the phrase "Merry Christmas," a point Fox News monitored over Obama's tenure. We'll continue to monitor Trump's messaging through the new year and over his subsequent years in the White House. But given his use of the phrase "Merry Christmas" in the annual White House greeting card, and his avoidance of the term "Happy Holidays" on Twitter and the White House website since taking office, we're moving this promise to In the Works. By Allison Graves on Friday, January 20th, 2017 at 1:24 p.m.
Donald Trump has been vocal about his support for using "Merry Christmas" instead of "Happy Holidays," especially when it comes to businesses using the phrase. "If I become president, we're going to be saying Merry Christmas at every store," Trump said at an Oct. 21, 2015, rally in Burlington, Iowa. "You can leave (happy holidays) at the corner. ... Other religions can do what they want." This is a unique promise. Trump isn't promising to make everybody say "Merry Christmas;" he just wants to dismantle what he considers the politically correct culture that has made saying it somewhat taboo. Trump's promise to make America say "Merry Christmas" again aligns with his attempts to change the effects of political correctness. There are many major holidays in the month of December including Christmas, Hanukkah and Kwanzaa, so people use "Happy Holidays" as a blanket phrase in the winter months. "It becomes politically correct to not use the word Christmas," Trump said at the same Iowa rally. "That's not going to happen anymore." Some believe using the phrase "Happy Holidays" instead of "Merry Christmas," is waging war on the Christian holiday and infringing on people's First Amendment rights. For example, Starbucks in 2015 released a plain red holiday-edition coffee cup, which sparked a social uproar because the the cup did not mention Christmas. Some people believed that Starbucks did it to spite of Christmas. In response to the criticism, Starbucks said it tried "to create a culture of belonging, inclusion and diversity" by using a simple cup design. Trump can't make people say "Merry Christmas," but he can normalize its usage through his actions as president and by protecting businesses and people who use the phrase. According to Pew Research, the majority of Americans celebrate Christmas (at 92 percent), but there are still millions of Americans who do not. Trump has left the door open for people of other faiths to say whatever they want, though. 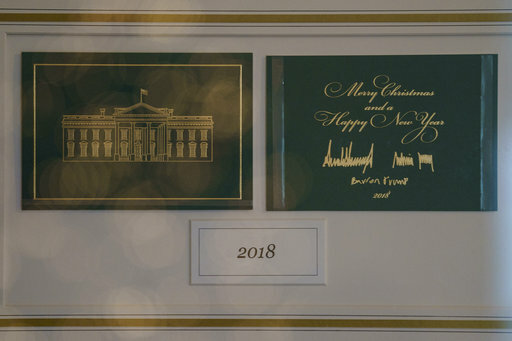 Even Trump himself released a Christmas card in 2015 with the phrase "Happy Holidays." Former President Barack Obama and his family also released cards with "Happy Holidays" for 2016. Screenshot from Independent Journal Review.